Watching the clock when waking up in the morning, watching a book in the school and looking at family and friends. We are constantly glancing towards someone or something. Have you ever just closed your eyes and walked for a while? The fear of the unknown will likely prevent you from taking even a few steps forward, and you will surely want to open your eyes to escape the fear. However, there are some people around us living in that fear. They must face the unknown every day even if they want to escape. For these people, there is a group of students helping them communicate with the world through Braille. SMT met Sookmyung Volunteering Group of Braille Translation, who communicate and love through feelings. Before getting started, please provide our readers with a brief introduction about Sookmyung Volunteering Group of Braille Translation. The group is the only volunteer organization in Korea in which members include both alumni and presently enrolled students. The group members are all volunteers who practice leadership by serving the community under the slogan of Sookmyung, “Gentle power to change the world”. Three of the members represent the alumni membership, and they include myself, vice-head Kim Yeonghye, Guidance Professor Kang Aejin, and student representatives Ahn Yeji, from the Department of General Education ’17, and Na Heewon, Department of Software Convergence ’17. 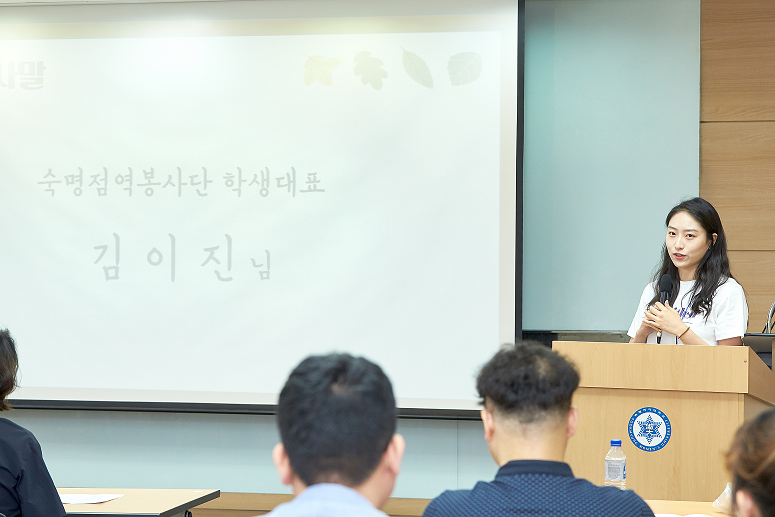 What motivated the creation of Sookmyung Volunteering Group of Braille Translation? During my service with Korea Braille Library in 2005 to 2008, I learned visually impaired students did not have access to the same number of books as other students. With this realization, I thought about how I could help those students using my job as a teacher. I thought about volunteering and wanted to involve Sookmyungians to make it more meaningful. For this reason, I established the group at Sookmyung. What are the main activities of Sookmyung Volunteering Group of Braille Translation? Before talking about our activities, I would like to comment on the activities of similar groups that create braille books and donate them to students with visual disabilities. The problem with this is that students who need certain books in order to prepare for midterms or finals do not always receive them in time. Therefore, our group divides the book into sections and as soon as the section is translated, we send the unit to the national blind school. This allows us to pass various translated sections of various books and subject-matter in a timely manner so that visually impaired students receive needed material quickly. Moreover, when an urgent request is placed on a text, we work on translating the material immediately. Sookmyungians in our group are currently working on elementary, middle, and high school learning material as well as texts needed by college students or other visually impaired people. In other words, we are helping not only students but all visually impaired people in Korea. What exactly is the ‘Shake Hands Day’, one of your prime activities? Shake Hands Day is a day when translated material recipients and translators from Sookmyung Volunteering Group of Braille Translation meet in person and form friendships with each other. Our group members willingly participate in the service work whole-heartedly, so it is hard to distinguish between service work and labor when one is translating once a week. However, our members take pride in their work as it is a necessary material for people to succeed. Also, many members used to feel pity for blind or visually impaired students, but after participating in the club, they learned that the stereotypes they had were wrong. In other words, members realized they were no different from others. They felt the same happiness and the same sadness like us. Would you elaborate more on how the braille translation process works? These days with advanced technology a program translates Hangul into Braille, so club members need only to enter text into the program. After inputting a USB text file written in Hangul into the program, it is converted into braille. Visually impaired students then have access to the translated materials on their braille information reader (BrailleSense Polaris). Prior to this program, the visually impaired had to rely on recordings. Volunteers, who type the text in Korean so that it can be translated, enable the visually impaired to read texts; they rely on the hands of volunteers. There are some places that produce study books for blind students, but the waiting time is long, so it's very difficult for students who need the material to prepare for a midterm or final exam. Typing texts into Korean doesn’t sound difficult, but it is not easy, and it takes much time. Can every Korean text be translated into braille? Yes, everything typed in Korean and on a file can be translated into braille. However, some archaic words, math formulas, and science terminology cannot be translated. In cases like these, we must enter them in braille directly, and alumni proofreaders and their families aid in the process. 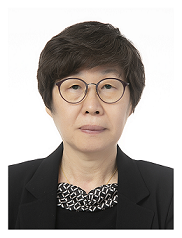 Seolsoodureihoe, a group of retired professors and teachers from the College of Education at Seoul National University, has partnered with Sookmyung Volunteering Group of Braille Translation to support the entering of math in braille. Then, what do you find most difficult? Each year textbooks are revised or altered. Typically at least two grades in elementary school, one grade in middle school, and one year in high school will have different textbooks. This means that about 10 subjects in each school will need to be retranslated for the school year. For this reason, the start of each new semester is always hectic. Textbooks have changed again, so there's a lot of work to be done. Please share with us one of your most memorable episodes. I remember the time when we held a concert with the visually impaired at Sookyeondang. At that time, many eight-year-old children were on stage. Now, they have grown and are high school students. I can picture them in my mind, singing at the event, and now they are mature high school students playing samulnori and the clarinet. How do you afford all the expenses that are incurred for the volunteer work? Since day 1, Chunjae Education, Neungyule Education, and Daesung Institute have provided us with printed copies of the translated books whenever we request them without charging any fee. They have been doing this for the last 10 years. All other expenses incurred when organizing an event are covered by alumni. What can Sookmyungians do to help their fellow Sookmyungians who are visually impaired? Rather than rushing to provide help, it is better to ask the individual first whether they are in need of your help if you believe they need assistance. That is, do not assume they need help. Ask the visually impaired Sookmyungian first if they need help. If they ask for your help, you can best assist them by typing up the text into Korean and saving it to a USB, then give it to them before class. Sookmyungians can also volunteer at schools for the visually impaired. They are also grateful for tutoring or even the recording of your voice. 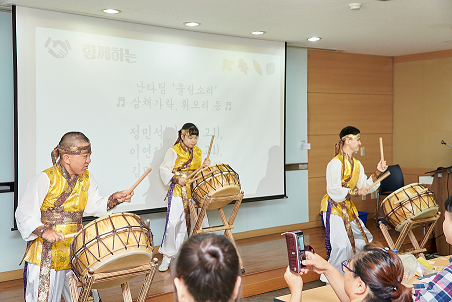 At Sookmyung, the Disabled Student Resource Center is often recruiting class guide volunteers, and of course, the best way is to join Sookmyung Volunteering Group of Braille Translation. Personally, I would love for the government to provide access to all books to every member of society. Then visually impaired people would also be able to read all the books they desire just like the rest of society. Until that day is realized, I will do my best to translate books into braille translating, thereby embodying the idea that a book can change the world. Plus, I will endeavor to educate people on the difference between being different and being intolerant towards people who are visually impaired. Please, leave a few final words for your fellow Sookmyungians. “Service is a duty to God.” This saying became locked in my mind since reading A Calendar of Wisdom. Volunteering is not difficult. To live, we need help, and we must give help. I hope that each of you changes the world with gentle power.